Shop Fannie May Mint Meltaways (1.5 oz. )1.5 oz. Shop Fannie May Pixies Chocolate Candy (1.5 oz. )1.5 oz. 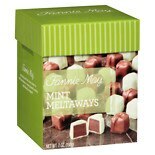 Shop Fannie May Meltaways Candy Mint (7 oz. )7 oz.